A website’s landing page is an important element (if not the most) for a successful marketing campaign. If you want your product to be a success, you’re going to have to build an awesome, attractive landing page. There are several companies that specialize in landing page optimization strategies, including visitor behavior tracking, session tracking, and advanced analytics. But they usually come with a monthly fee which add up to a few hundred dollar annually! For the folks who are starting out, or aren’t quite ready to shell out the extra cash for a fancy landing page, WordPress (as always) has a solution for us. That’s why we’ve complied this list of the most awesome WordPress themes for landing pages. Enjoy! Ok, you got me – this is technically a plugin, but it really is the best WordPress landing page option on the web so it had to come first. Thrive Architect (formerly called “Landing Pages”) comes with pre-made templates, the ability to add landing page sets (a.k.a. templates that have been show to work very nicely together), and intelligent drag & drop editor and tons of customization options for text, images, colors, backgrounds, custom content and of course translations. And it’s super fast – an important quality to boost conversion rates. When it comes to landing page WordPress themes, Pergo is one that really stands out. The theme includes 30+ amazing demos you can use to get started building your landing page. Plus it includes the WPBakery Visual editor -(along with 10 custom UI elements) that you can use to point, click, drag & drop to create one of a kind layouts. Other powerful features of Pergo include a/b split testing, sidebar options, WPML support, megamenu included, 630+ Google fonts, SEO optimized layouts and more. If you want full control over your landing page, then a well coded theme with a reliable page builder is a sure bet. The Total Drag & Drop WordPress Theme is one of the best of its kind. With the powerful Visual Composer drag & drop page builder, hundreds of custom and easy to use live WordPress Customizer Options (for unlimited colors, 700+ Google fonts, any font size or line height, custom cropping and tons more), and premium sliders (Layer & Revolution) there’s nothing you can’t create with Total. Landing comes with 25+ pre-designed builder layouts, a Themify’s drag-and-drop page builder, multiple header options, full-screen design, events post type and more. Plus the theme is responsive and retina-ready. So it looks great on pretty much every device, making it a great choice for a product launch or business page. If you’re looking for a free, one page theme then you should definitely give Shapely a try. This sunning landing page WordPress theme includes easy widgets you can use to build your page. Complete with portfolio, parallax sections, testimonials, calls to action and more. Plus, Shapely is compatible with popular plugins. SO you can easily add a WooCommerce store, Gravity Forms, Google Analytics, etc. Give your new promotion a boost with a Leadinjection landing page. This WordPress theme was designed to help you grow your business and generate new leads. Start with a pre-made layout (there are 12 to choose from), then customize with the included page builder and built-in modals. Use triggers and exit intent to capture new leads. Other features include Revolution Sider, font icons, click to call buttons, Mega Main menu and mire. eBooks are a great way to grow your mailing list. This theme helps your achieve that goal and all you have to do is import the sample data then replace the dummy content with information about your book. Prestige comes with 9 different landing page templates, including product launches, real estate announcements, coming soon squeeze pages, app landing pages with static image or HTML5 video background. Hestia is a top free theme for a reason – it’s easy to use but offer great features for just about any business. The theme includes styled widgets that you can add, customize and reorder to create your own landing page. Need some help getting started? Just use Hestia’s 1-minute setup options or follow along with video tutorials. Plus the theme is compatible with WooCommerce, most page builders (for more flexibility), and translation plugins. Pulse puts your content forward in a bold and fashionable way and makes for a pleasant user experience. It includes the Visual Composer plugin, 4 custom post types (portfolio items, slides, team members and testimonials) and an integration with WooCommerce. Select can be used to create a variety of landing page themes ranging from restaurants to app landing pages. It comes with 24 pre-built landing page templates – each serving a different domain. Other key features include built-in header styles, footer options, forms, intros, diagrams, testimonials, pricing tables and maps. Everything you need to build a convincing landing page with WordPress! Landkit is a lovely landing page WordPress theme with a hybrid composer you can use to build custom pages. Just install the theme, then use the sample demos and theme options to create squeeze pages, registrations forms, product launches, free trials, contest splash pages and more.The theme is also responsive, RTL and translation ready. OnePress is a great example of how to build a landing page the right way on a budget. This theme made our list of the best landing page WordPress themes thanks to intuitive features for adding links, services, gallery, counters, staff and a contact form. OnePress is also responsive, SEO optimized , localized and crossbrowser compatible. A classic builder theme from Elegant Themes, Divi is one of the most popular theme options for any type of website. Including landing pages. Just use the included Divi builder to create custom page layouts. The visual editor, responsive editing, 46 content elements, global options and easy to use pre-made layouts make Dive a great choice. If you love the Elementor page builder, then Astra is a great option. This Elementor powered multipurpose theme is completely free, and is designed to complement the popular page builder. Use Astra’s prebuilt website designs, easy layout settings, header options, color and typography settings to create your perfect landing page. Plus it’s fully compatible with WooCommerce. Cian is an elegantly designed app landing page based on Bootstrap 3 framework. The theme also features Mailchimp integration, multiple backgrounds options (image slider, video and parallax), and dedicated gallery & pricing modules. Another Bootstrap based app landing page theme, EOS comes in a light and dark version. Plus the theme includes 4 layout styles, 8 color/skin templates, parallax effects and video background. Design the perfect landing page for your new app or product with vApp. This complete app landing page template includes features to make your launch go smoothly. Don’t waste time fussing with a from scratch website. Instead, start with one of 29 awesome layouts then use the drag and drop builder to tweak it. Landing Page from Templatic is an all around great theme for landing pages. With support for WPML, advanced WooCommerce integration, portfolio management, Mega Menu and automatic updates Landing doesn’t disappoint. Built your landing page with the free Pixova Lite WordPress theme. A straightforward layout with callouts, portfolio, testimonials, staff and contact form is a great option for a business or conference just getting started. Use the built-in theme options to customize colors and typography and you’re ready to launch! Cryptocurrencies are a unique niche so it only makes sense that there are WordPress themes designed specifically for them. 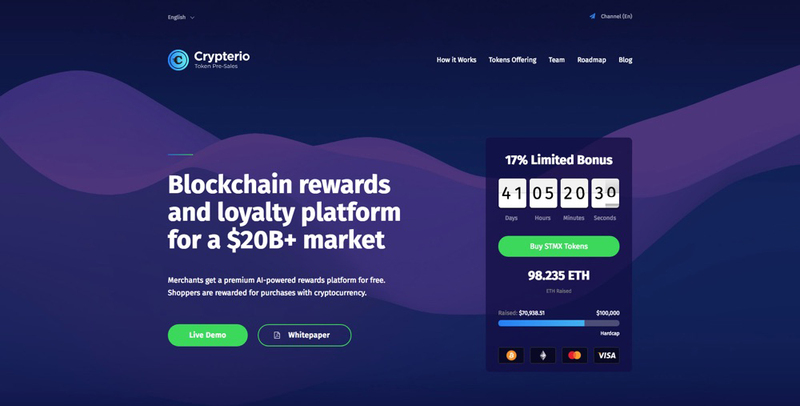 Crypterio is a powerful theme designed specifically for ICO landing pages and crypto-agencies. Quick import demos, easy content blocks, ICO countdown timer,whitelist pre-signup and more make this theme stand out. (check out our list of the best cryptocurrency WordPress themes to see more awesome options). Create a serene single page website for your business with Enlight. This minimal and clean design theme includes a visual page builder, built-in theme panel options and a custom post manager so you can quickly create and customize your site. The theme is also responsive, cross browser tested, and translation ready. The Simple theme comes with Visual Composer for WordPress and a couple of dedicated Visual Composer extensions. Based on Bootstrap 3 framework, Simple theme includes parallax background effects, icon fonts (Entypo, Font Awesome and Glyphicons) and CSS3 animations. 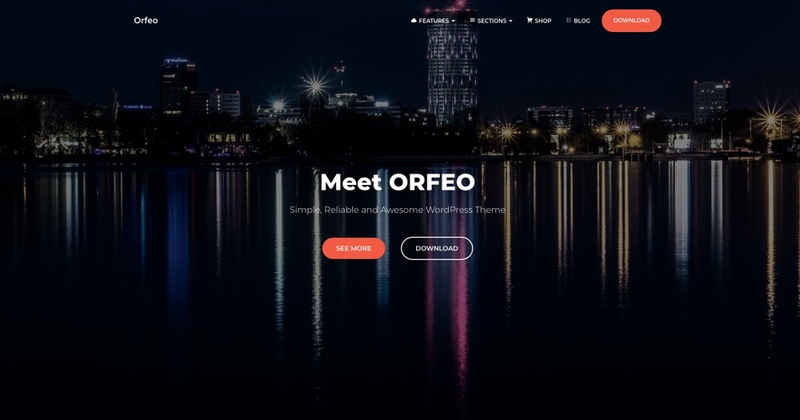 The free Orfeo theme is a great choice for a simple landing page. There aren’t too many frills with this theme, but that’s what makes it great. It’s almost Google-esque in it’s clean design. Use the WordPress Live Customizer to change your design, add custom backgrounds, simple mega menus and more. Foton was create specifically for app and software landing pages. This tech-y WordPress landing page theme focuses on great layouts, a responsive design, easy color options and of course no coding required to set itself apart from the crowd. Plus the theme includes Visual Composer page builder, Slider Revolution and WooCommerce compatibility. The developers behind LeadEngine had simplicity in mind. Especially when it comes to building a website. 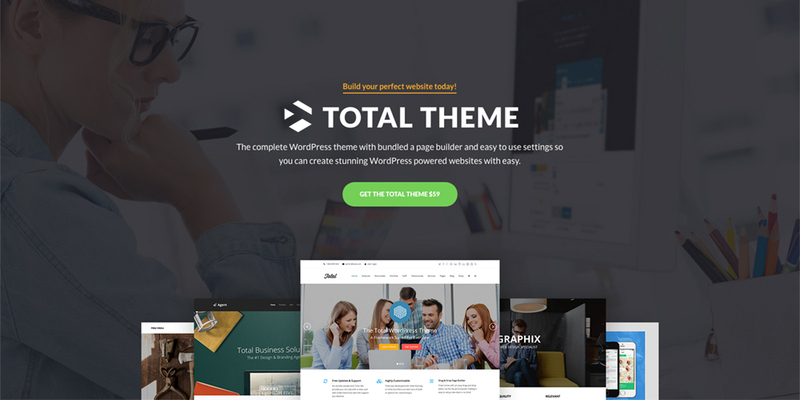 Just install the theme and use over 200+ template blocks to create a layout, or get started with one of 35 sample sites. LeadEngine includes a built-in portfolio, blog, theme and typography options as well. Stribe is a great WordPress landing page theme to launch your site ASAP. This lovely theme includes an easy 1-click demo installer, color pickers and a simple visual page builder. Plus it’s RTL and WPML ready. With these tools at your finger tips you can quickly put together a professional landing page for your new venture. The free App Landing Page theme by Rara is a great option if you’re on a budget. Built-in options for videos, Apple/Google store buttons, app features, and social media are easy to use. Plus the responsive design and GDPR compatibility are a really nice perk to this free theme. Design you landing page with Ekme. This one page WordPress theme is a pack of minimal, portfolio style landing pages. Making it a perfect choice for designers, freelancers and agencies. Just install the theme and use the demo importer to get started. From there use theme options to add your work, contact info, skills, social media and more. These are just our top picks, but hopefully you’ve been able to see a good variety. There are a lot of landing page themes our theme. However, if we had to narrow it down Thrive Architect & Total would be our absolute favorites. But what do you think? Have you used any of these themes, or can you recommend another? Share your thoughts in the comments below! Hi Sourav, you write : “A website’s landing page is an important element (if not the most)”. In Total theme we can found landing page option on page building. Could you tell us, why a landing page is important and how to build a good landing page ? Thank you very much, in advance. This is AJ the creator of the Total theme. If you have purchased the theme, thank you! You can always ask me questions like this in the ThemeForest comments, just so you know. Basically landing pages are used for marketing purposes. If you are purchasing advertisements you want to make sure these advertisements go to a “landing page” which talks about your product or service. This page should be optimized to not only give your visitors a good understanding about the product or service but also to “sell” it. You should be using compelling images, videos and text to convince people to buy your product or service. If the landing page is not well optimized then you may not be converting customers at a good enough rate.